Are you worried that you or someone close to you is suffering from an OxyContin addiction? If so, help is at hand. Here, we tell you all about this strong prescription narcotic drug: addiction, its effects on the body and brain, the statistics on related deaths through overdose, the dangers associated with OxyContin abuse, the signs and symptoms of addiction, the withdrawal effects, and most importantly how we can help you or your loved one to access the best treatment possible for a safe and successful detox and recovery. We will also advise you of treatment options are that are available on the NHS and free services as well as private rehab. Addiction Helper have helped well over 10,000 individuals worldwide to access the correct support and treatment for their individual addiction and circumstances. We are experts in treating addiction and are the leading authority on rehab treatment options in the UK. If you or a loved one are struggling with an OxyContin addiction, please call us or chat to us LIVE online now for immediate help, advice, and support. We can show you the way forward to breaking free from OxyContin addiction permanently! OxyContin is a very powerful semi-synthetic analgesic opioid pain killer; legal in the UK only on prescription. Its pain relieving effects can last for up to 12 hours. Experts who have conducted research in the U.S say that it the most commonly abused opioid (including prescription and illegal Class A drugs) in the United States. OxyContin is not only highly addictive, but can also be lethal – IF abused, not taken as prescribed, or mixed with other drugs especially other opioids or sedatives. It is generally only prescribed for the relief of moderate to severe pain for around the clock management. It is not to be used on an “as and when needed basis”. It is prescribed for the short term management of pain relief, such as a post-operative procedure or for chronic pain diseases such as Cancer; this due to its long lasting powerful narcotic effects and its potential to lead to addiction and dependency. OxyContin is a formulation of the powerful opioid painkiller Oxycodone. When OxyContin is taken as directed, it IS a safe and very effective medication which can prove to be very beneficial for those with moderate to severe or chronic pain. It is most commonly prescribed to improve the quality of life in Cancer patients or those with chronic pain related illnesses that have become tolerant to Morphine and other less strong opioids. 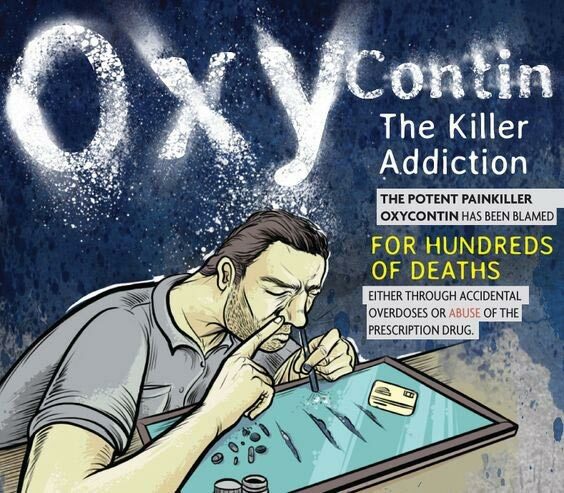 As a nationally recognised abused drug, in 2010 Purdue Pharma reformulated their long-acting Oxycodone line, marketed as OxyContin to make the pills very difficult to crush or dissolve, thus reducing the likelihood of individuals snorting or injecting it. However, this does not stop individuals from taking multiple pills or crushing/dissolving the short-acting pills and abusing them. OxyContin and Oxycodone are both derived and synthesized from the opium poppy. In addition to being an extremely powerful narcotic drug, there is a huge risk for someone who uses or abuses it regularly to develop a tolerance and dependence to the drug, even when it is taken as prescribed. It has been proven through scientific research, that Individuals that are addicted to prescription opiates such as OxyContin and Oxycodone are 40 times more likely to develop a Heroin abuse problem once they have developed a tolerance to the drug! If a loved one or family member is buying OxyContin from the black market, the appearance of the medication can vary greatly; always seek advice if you find pills or tablets that you do not recognise. OxyContin exposes both patients and those that misuse them to a high risk of developing an opioid addiction or abuse problem. Not taking the drug as prescribed can lead to overdose and death, mainly through respiratory failure or the individual choking on their own vomit (OxyContin suppresses the cough reflex). Patients that are prescribed OxyContin should be very carefully monitored by their Doctor or Consultant for signs of addiction, misuse or abuse. Physical dependence to OxyContin can develop very quickly, within as little as 3-5 days of continuous use. This is why this controlled drug should only be taken on prescription and monitored stringently by a medical professional. Once an individual has become tolerant to a specific dosage, they will no longer gain the initial effects of the drug; at this point, they will need to increase the dosage. In a prescribed patient’s case, the dosage will be reviewed and possibly increased for them by their doctor. Abuse or misuse by crushing, chewing, snorting, or injecting the dissolved product will result in the uncontrolled delivery of the active agent Oxycodone and can result in overdose and death. OxyContin is designed for the slow and controlled release of Oxycodone into the bloodstream; taking the medication any other way other than prescribed can be extremely dangerous. Strong Opioids such as OxyContin are extremely attractive and sought after by opiate addicts for the intense euphoric high they produce, very similar to that of Heroin and Morphine. Addicts of other opioids are much more likely to abuse this medication and put themselves at high risk of overdose, especially if they are mixing the medication with another opioid, or depressant drug such as Valium or Alcohol. OxyContin and other opioids act by attaching to specific proteins called opioid receptors in the brain. These proteins are also present in the spinal cord, and gastrointestinal tract. 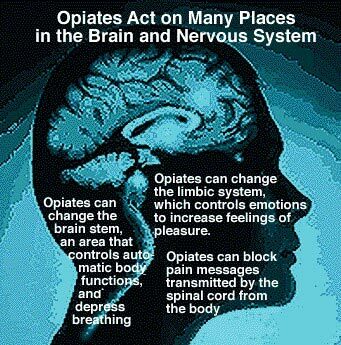 When the opioid attaches to the opioid receptors in the brain and spinal cord, they block the transmission of pain messages to the individual’s body and brain, thus providing effective and powerful pain relief. The danger with all opioids, but especially stronger opioids such as OxyContin, Morphine, Methadone, and Heroin, is that they also inhibit parts of the individual’s brain that controls coughing and breathing. This is why most individuals that die from overdose do so due to respiratory failure or choking. Risk of death from overdose should only occur if an individual is abusing or misusing them. OxyContin is safe if taken EXACTLY as prescribed by a qualified Doctor and carefully monitored during the titration process. OxyContin has very similar pain relieving effects to that of Morphine but is less intense as released in a more controlled way and chemically slightly different in its composure. The effects on an individual taking the medication as prescribed will likely include: relief from pain, decreased appetite, euphoric feelings depending on the levels of pain present and how effective the titration process is, calmness and reduced anxiety and slowed breathing and heart rate. For an individual that misuses or abuses OxyContin the euphoric effects are increased as there is no pain to block; they will likely feel the intense effects of euphoria, feelings of warmth and calmness, blocking of negative emotions, slowed breathing and heart rate, feelings of sleepiness, drowsiness, and contentment. 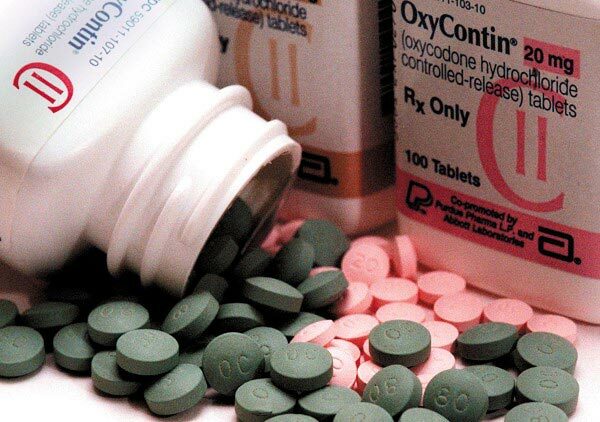 How the Brain’s Reward System Responds to OxyContin? The reward system is centred in the brain and it is what is responsible for allowing an individual to feel pleasure. Opiate medications activate the neurotransmitters in the reward system and allow a person to feel euphoric like effects by flooding the brain with the naturally organic chemicals Dopamine and Serotonin. Once the effects of the opiates have worn off, these chemicals crash to reduced minimal levels; the brain recalls the feelings of pleasure and seeks what activated the reward system. Overtime, the brain becomes tolerant to the levels of Dopamine and becomes reliant on the drug to produce it; at this point, they are both physically and psychologically dependent on the drug to feel any pleasure at all. The effect from opiates and opioids normally don’t last with repetitive use. This is known as developing a tolerance; addiction and abuse can easily follow. In order for the individual to feel the same pleasurable effects they initially experienced, they have to take a higher dosage or resort to different methods of administration. They may also start to mix the OxyContin with other drugs and opiates; this is especially dangerous. Please read on to learn more about the dangers of opiate overdose. Is OxyContin Safe to Use during Pregnancy? If you use OxyContin while you are pregnant, your baby could become dependent on the drug. This can cause life-threatening withdrawal symptoms in the baby after it is born. 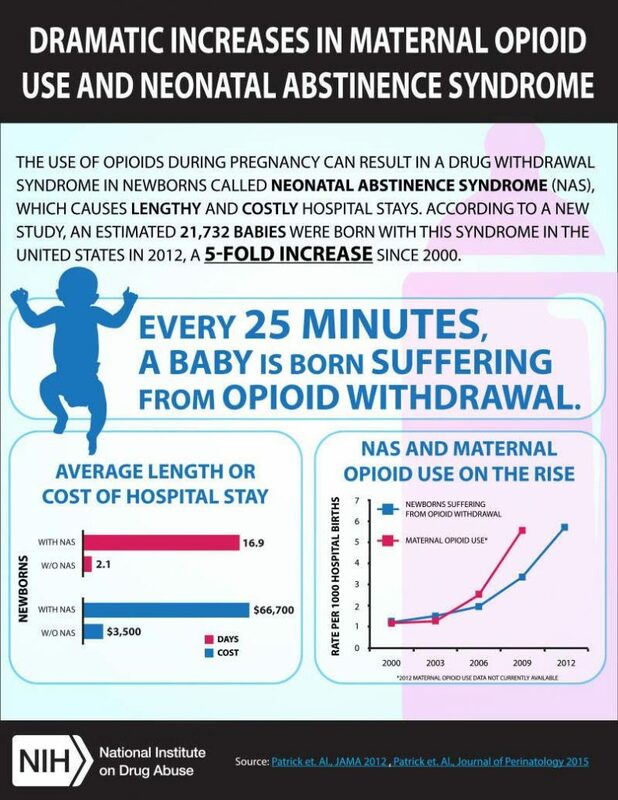 Babies born dependent on addictive medications such as OxyContin or Oxycodone may well need medical withdrawal treatment and close monitoring for several weeks post-delivery. If you have been abusing the drug during your pregnancy or have an addiction or misuse problem, it is vital that you tell your Consultant and midwife. Failing to do so could put your baby’s health at immense risk once it has been born. If you or a loved one are using, abusing, or are addicted to OxyContin it is important that you arm yourself with the facts of this particular drug. This drug puts users at a great risk from its dangerous and sometimes deadly effects. In this section, we tell you about the risks associated with short term use and long term use. Whether you or your loved one are prescribed OxyContin, abusing it or addicted to it; this is information that you should be aware of. If you or a loved one are prescribed OxyContin and taking it as prescribed, there is still a huge potential for a tolerance and dependency to develop even if you are only taking it for a short while. All Opiates are very addictive and an individual can build a physical dependency within as little as 3-5 days of continuous use. At this point, it is important to point out that as long as you take the medication as prescribed and are regularly monitored, OxyContin can really improve the quality of life in those suffering from severe or chronic pain. This page is not aimed at putting off individuals who genuinely need the medication, but to provide information so that you can continue to take it safely and not put yourself at unnecessary risk. When taken as prescribed, it is safe and is a powerful pain reliever. The euphoric effects are reduced as the medication concentrates on the pain and works as it should. It is however entirely possible to develop a physical dependency; this is where if you do not take your medication or miss a dose you will suffer withdrawal effects. It is important to read the information leaflet that accompanies the medication. If the source of the original pain is resolved and you are still taking them, you may want to question if you have developed a physical and/or psychological dependency. That being the case, we would recommend that you speak to your doctor or consultant about a gradual withdrawal regime, to wean you off the medication at a safe and controlled pace. It is also vital that you do not drink alcohol or take any other unprescribed medications whilst taking OxyContin as this will increase its sedative effects; and that if affected by drowsiness or reduced alertness that you do not drive. OxyContin is designed to work properly only if swallowed intact. Taking cut, broken, chewed, crushed, or dissolved tablets can result in a fatal overdose. Tablets should be taken one at a time. Take each tablet with enough water to ensure complete swallowing immediately after placing in the mouth. If you or a loved one have an addiction or dependence to OxyContin and are struggling to stop, please call us now or chat to us LIVE online for free expert advice on the best detox treatment options available throughout the UK and also overseas. Under the UK’s Drug Driving Law, it is an offence to drive whilst impaired by any drug including prescribed medications that can affect your ability to drive safely, even the following day after taking them. Penalties are the same as drink driving, so be sure that you are not suffering from any adverse reactions from taking OxyContin before getting behind the wheel of a car. The same applies to operating any heavy machinery; OxyContin is a powerful narcotic and can seriously impede your reactions, judgement and decision making. It is important to remain safe and not put yourself or others at risk whilst on this medication. More important information on the Drug Driving Law in the UK and the associated penalties, if prosecuted, is available online. One of the long-term effects of OxyContin and Oxycodone is addiction; this is characterised by a greater physical dependence on the drug and tolerance to the dosage. Tolerance to a drug means that you must take more and more of the medication to get the same early effects. After long-term use, men may experience a decreased level of testosterone or enlargement of the prostate. Other long-term effects include excessive sweating, swelling in the arms and legs, and chronic constipation. If the medication is being abused, all sorts of implications can arise from long term and short term abuse. Long term abuse of this medication often leads to addiction, tolerance, and dependence; this can put immense strain on the body’s vital organs and compromise the efficiency of their function. Psychologically, the individual can suffer from suppressed emotions, dissociation, reduced motivation, disturbed sleep, severe mood swings, depression, suicidal ideation, anxiety, panic disorder and even psychosis. They are likely to go to greater lengths to get their hands on the drug, taking bigger risks, and accumulate more and more serious consequences as a result. 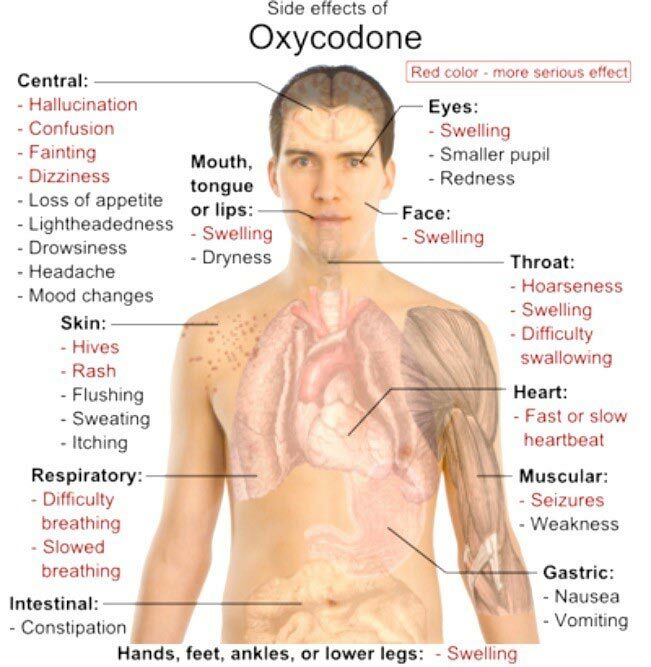 Addiction and abuse of OxyContin can result in overdose, which can lead to respiratory depression, coma, and death. Addiction is more than just a physical dependence; as a recognised mental health illness, it requires very specialised therapeutic treatment in order to overcome. We will talk more about appropriate treatment options further on in this article. Because long term and chronic use of OxyContin and Oxycodone lead to tolerance and physical dependency, you are likely to experience withdrawal symptoms if a dosage is reduced or you stop taking them too quickly. Abrupt withdrawal (i.e. cold turkey) will cause severe withdrawal symptoms. The level you experience the withdrawal symptoms at will depend on how much you have been taking, the length of your dependency and how quickly you reduce or stop them. Withdrawal symptoms can involve signs of central nervous system hyperactivity and will generally peak at 48 to 72 hours after your last dose. Physical withdrawal symptoms will be considerably diminished within a week, but it may well take a lot longer to reverse the psychological dependency, especially if you are suffering from addiction. If you have been taking the medication for a long period of time and at a high dosage, there is a risk of your developing PAWS – Post-Acute Withdrawal Symptoms or Protracted Acute Withdrawal Symptoms. This is where withdrawal symptoms last longer than medically expected and in some cases can go on for up to a year after discontinuation of certain addictive medications. It is important to note that whilst withdrawal from OxyContin and Oxycodone is very uncomfortable and can be distressing if carried out too quickly, it is not fatal if the detox is conducted in a controlled manner and the individual is not dependent on any other drugs. The safest way to withdraw from OxyContin and Oxycodone where there is a dependency present is under strict medical supervision. Where there is an addiction or abuse problem present, ideally the individual should receive intensive treatment through a regulated private rehab so that the individual can address the psychological aspect of their addiction. If you require any information on an OxyContin rehab detox and treatment, Addiction Helper can help; this is our area of expertise. If you or a loved one have an addiction or dependence to OxyContin, please call us now or chat to us LIVE online for free expert advice on the best detox and rehabilitation treatment options available throughout the UK. 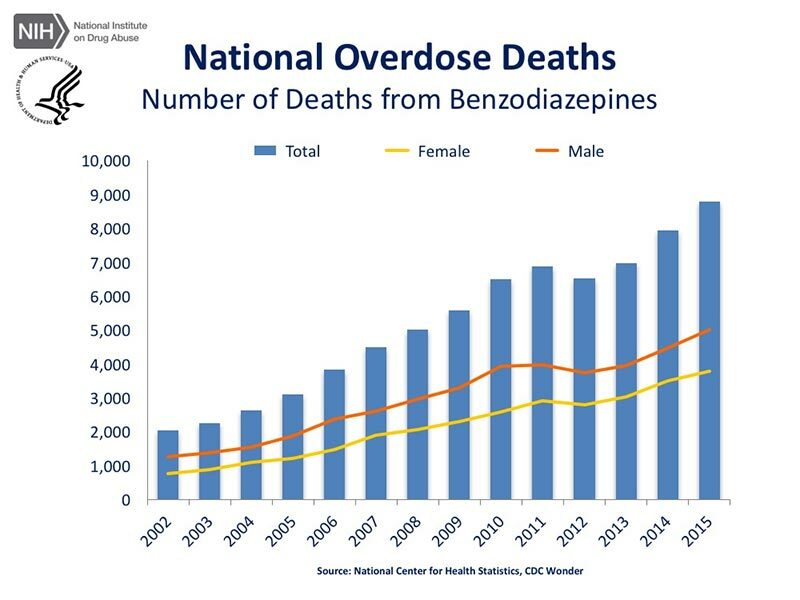 Statistics released from the NIH (National Institute of Health) show that prescription opiates are responsible for almost 50% more deaths than the illegal Class A drug Heroin. Furthermore, their studies reveal that there is a much higher percentage of female related prescribed opiate deaths than there are Heroin related deaths, although the overall majority in both cases state that middle aged males are at the greatest risk of death of legal and non-legal opiates. Sales and prescriptions of OxyContin have overtaken sales and prescriptions of Morphine in many countries, especially in the U.S, with an alarming rise in the amounts being dispensed and sold. OxyContin addiction is a worldwide problem. Research and statics reveal that the potential for an addiction developing is higher than that of Morphine. Originally OxyContin was marketed as a less addictive opiate analgesic, but the statics reveal otherwise. Mixing OxyContin with another depressant drug puts the individual at high risk of overdose, resulting in coma, respiratory arrest, and even death. Mixing OxyContin or Oxycodone with Benzodiazepines, Alcohol or another opiate is particularly risky. Overdose or mixing the drug with other depressant drugs can cause the brain to shut down the essential life giving breathing mechanism, as it becomes too relaxed to respond appropriately to the body’s functional needs. For lighter skinned people, the skin tone turns bluish purple, for darker skinned people, it turns greyish or ashen. Reacting quickly to an opiate overdose saves lives. Even if the individual appears to be just sleeping, if they are making any gurgling or unfamiliar sounds, it is well worth trying to wake them up and try to get a response. If in any doubt at all, call the emergency services immediately for advice. With a loved one, any marked change in an individual’s appearance or behaviour should not be ignored; it could well be the best indication that your loved one has a problem with OxyContin that has spiralled out of control. If you are still unsure or need professional advice as for how to help your loved one get the correct treatment or a detox, please call us and we will do all we can to help get them well! In this section, we tell you all about the treatment options available both on the NHS and through private rehab for OxyContin addiction, abuse, and dependence. Addiction is more than just a physical dependence, there is a huge psychological component to addiction. Successful treatment means treating both the dependency and the psychological illness of addiction; ideally simultaneously within a safe environment for optimum results. For those that suffer from addiction, inpatient rehab is the best option for intensive treatment. It also takes the individual away from the toxic environment that often goes hand in hand with addiction, and places them in a safe and secure recovery focused place, where they can concentrate on themselves fully and recover. Addiction Helper specialise in treating addiction and have helped over 10,000 addicts to access the correct support and treatment for their individual addiction. 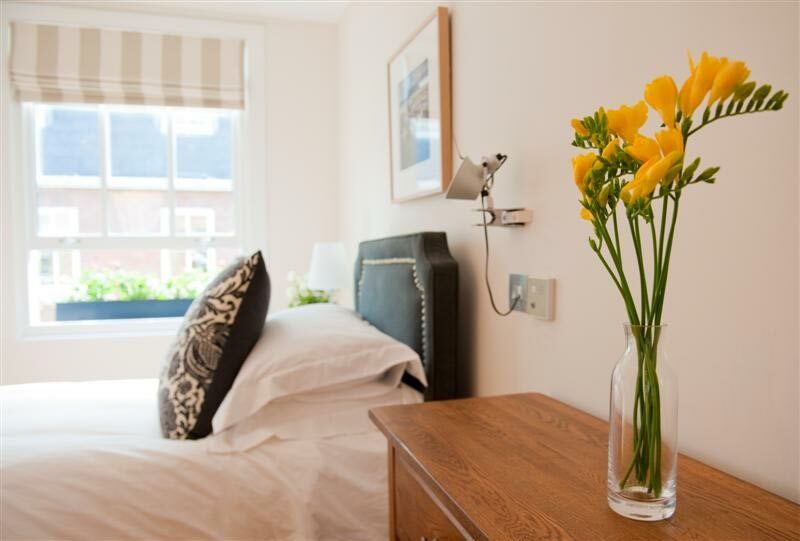 We can find you or your loved one the ideal treatment plan and rehab facility in which to recover from OxyContin and OxyCodone addiction; ranging from affordable to luxury treatment, with locations all over the UK and also overseas. We work with only the best detox and rehab clinics available. Addiction Helper has strong working relationships with over 100 CQC exemplary regulated treatment centres that have proven success rates and adhere to very strict protocols and safety regulations. They deliver the very latest in evidence based addiction treatment methodologies and we have personally visited and approved each and every single one. We are also able to inform you of the all options available locally on the NHS and Free Services, please read on to find out more. Withdrawing from OxyContin can be extremely uncomfortable, even dangerous; especially when an individual is dependent on higher dosages or when mixing with other habit forming drugs. Detoxing from OxyContin should be carried out under medical supervision only. Community detox with the help of your GP is possible if you are very determined and have a good support system. This generally works well for those that have a dependence but not an addiction. Addiction is a chronic relapsing brain disease, as recognised by Public Health England and medical institutions around the world. An individual can become dependent on OxyContin without having the disease of addiction. Addiction is a mental health illness and very serious, it requires not only a physical detox for any dependence, but also intensive psychological treatment in order to prevent relapse. Those that suffer from addiction will have a very different experience towards the drug than those that do not. They will find it extremely difficult to detox from OxyContin successfully without addressing the psychological aspect of addiction, which is the driving force behind their constant need to escape reality and themselves, through whatever means. Any detox attempted for an addict or someone with an abuse problem should be combined with behavioural treatment therapies. Counselling and other support services are extremely helpful in order for the user to live an drug-free life and avoid relapse. Residential rehab treatment is particularly effective in dealing with OxyContin addiction and abuse. 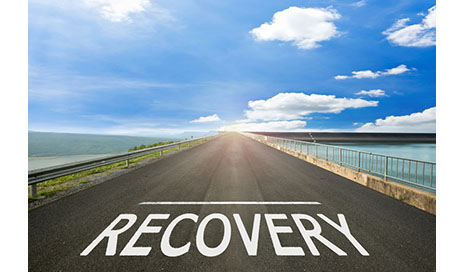 Private rehab detox will be controlled by medical professionals, experienced and qualified in addiction treatment. They will ensure that the individual is safe and as comfortable as possible throughout the detoxification process. It takes the control out of the user’s hands and places it firmly in the care of medical professionals in a temptation free environment. In addition, the individual will also benefit from intensive treatment for any other alcohol, drug or behavioural dependencies or addictions present. They will also simultaneously receive intensive treatment for any co-occurring illnesses, including Depression, Anxiety Disorder, PTSD, OCD or an Eating Disorder. Follow-up treatment is also essential to keep the individual on the path to recovery. Addiction Helper, we will gladly help you to explore your options, and provide you with all the support that you and your family need for a successful detox and permanent recovery from addiction. Undergoing a strict detox regime that is medically supervised and psychologically supported in a safe environment such as a private rehab, is proven to be the safest and most successful way to treating an OxyContin addiction, dependence or abuse problem. It gives the individual the best chance of becoming OxyContin-free and more importantly, staying drug-free! Can You Get Free Rehab for OxyContin Addiction? Free rehab for OxyContin addiction can be accessed through two pathways; there are a select number of Christian Rehabs in the UK, but they are religion specific and not for everyone. The other route is to apply for funding through your local drug and alcohol team (DAT). You can find details here of your local DAT team. Funding for a prescription drug addiction is notoriously difficult to secure unless it is accompanied by an alcohol dependency or a Class A drug addiction. DAT takes self-referrals and also referrals from other agencies, so you do not have to go through your GP. By engaging with your local DAT you will receive key work session and access to groups held within in the centre. They can also arrange for counselling and arrange a reduction plan within the community. However, applying for funding for rehab is not easy and nor is it quick. On average it takes up to six months, a year in some areas. Waiting lists are very lengthily and funding is very limited, so therefore only awarded to most deserving cases; those that prove they are willing by attempting reduction, and attending all the appointments for groups and key work sessions. If you are considered a suitable candidate for drug rehab funding, you will be required to complete a pre-rehab course in preparation and to prove your dedication to getting and staying clean. Sadly, some die waiting for rehab, as most individuals with an addiction or abuse problem, will only seek out help once they have reached crisis point. Local drug and alcohol teams, due to demand and underfunding, are simply not equipped to respond quickly or intensely enough for those in crisis. DAT treatment is very helpful for those that do not have a chronic addiction problem, but many OxyContin and Opiate addicts find it extremely difficult to get and stay clean by staying in their own area. There is daily temptation all around and easy access to local dealers, not to mention the time in between appointments. Some individuals are required to attend DAT appointments by law if they have engaged in criminal activity and it is part of their probation requirement; this means that those that really want to get clean will also be mixing with some individuals who don’t, and who are only attending as part of their probation requirements. This further exposes them to high-risk situations and temptation. The quickest way to access OxyContin addiction detox and rehab is through a private rehab clinic. If you or your family have the means to fund this, Addiction Helper can assist you in an immediate admission today! We can respond to those in crisis. We offer everything, from affordable to luxury rehab and everything in between. Call us now for more information on how to access the best in OxyContin detox and rehabilitation centres in the UK and overseas. You or your loved one can access free local community support from 12 Step fellowships such as Narcotics Anonymous . There are also Smart Recovery group meetings available, which focus on goal setting in achievable measures. Please click on the links to find out more about their meetings and to locate one near to you. Sometimes your local DAT team will run Smart Recovery groups and NA groups, so be sure to ask what is available if you are receiving help on the NHS. At Addiction Helper we understand that addiction doesn’t just affect the individual sufferer, but that also loved ones and family members suffer too, often to a debilitating extent. The whole family has to heal in order to be able to support their loved one through the treatment process and to help get their own lives back on track. Many of Addiction Helper’s private rehabs provide a family recovery programme as part of our inpatient treatment programmes. If this is not something you are able to afford, there are other free associations that can be accessed in the community including Famanon and Adfam . Depending on the individual’s circumstances and the level of addiction or abuse they are suffering from, will indicate the type and the intensity of treatment required for a full and permanent recovery. Inpatient private residential rehab is the preferred option for success and safety. Addiction Helper can advise on many different rehab options to suit all budgets. Please do not hesitate to call us and speak to one of our knowledgeable and friendly addiction treatment experts. We can advise you or your loved one, free of charge, and provide confidential and professional advice on the best OxyContin addiction treatment programmes available in the UK and overseas. We only work with rehabs that are highly established, use proven methods of addiction treatment and detox, and are regulated by the Care Quality Commission (CQC). Our rehabs are very professionally run and adhere to strict safety regulations and guidelines at all times. Our patients’ safety and wellbeing is of the utmost importance to us. We can arrange urgent same day admissions wherever necessary and provide a completely bespoke and intensive detox and rehabilitation programme for you or your loved one. We witness the miracle of recovery from addiction daily; let us help you or your loved one to achieve what you never thought possible. For those that are in need of extended rehab care, we also provide secondary treatment and tertiary/sober living. We assist each and every patient in their successful integration back into society, drug-free. Our rehabs also work with a large network of training and education providers and can help our patients to build a future for themselves. Removing the drug is only the very beginning of a long road of change ahead. We are passionate about helping addicts, not only to become drug-free, but to become the person that they have always wanted to be. Furthermore, all patients that complete their rehab treatment programme with us, will receive 12 months complimentary aftercare at the rehab they undergo treatment with. We are also dedicated to helping the family throughout their loved one‘s addiction treatment and provide family support. When treating addiction, we look at the bigger picture, to give the individual sufferer and their family the best chance of a full and permanent recovery. Recovery from OxyContin addiction is possible, with the correct treatment and support. If you need help, call us or chat to us LIVE online now!